A review in the NY Times by Vivien Schweitzer has gotten some discussion on Facebook. She's not a fan of Morton Feldman's music, but got sent to review a performance of the composer's monumental, six-hour String Quartet No. 2. She didn't enjoy it, no surprise, and doesn't hear the virtues of the piece (and other Feldman works) that others hear. I've been trying to figure out why this review bugged me so much. Is it any different from my own feelings about the Tchaikowsky symphonies, or Joshua Kosman's about just about everything by Saint-Saens? It's just inevitable that critics will be sent to review works and composers they don't luv. It's especially inevitable in San Francisco, where the Chronicle and Mercury News have one classical music critic each. I understand a reviewer accepting a review in hopes of an epiphany, considering how Herbert Blomstedt turned me around on that Schubert symphony a few week ago. I believe that I've done a fair job with my own reviews of various works by Philip Glass, a composer of whom I have a highly mixed opinion. (There's a lot of dross surrounding the gold, briefly.) I am in the position of being able to turn down any review I don't want to write - and there's a list of works I won't touch, too. In this case, though...Feldman is such an idiosyncratic composer that were I an assignments editor, I'd very likely send someone with more sympathy toward the composer than Schweitzer. And if I were writing a review of a major work by a composer I don't like, I would try to focus on reviewing the performance, with fewer sideswipes at the composer. But I am not such an editor and I didn't write the review. I'm curious about anyone else's thoughts on this subject, since my own thinking looks a little muddled to me. Admission is free, although a donation of $20 is suggested for the support of the Lund University Foundation. For more information, visit www.iocsf.org. I can't get there, but maybe you can - it should be a great program. So, in this unbelievably busy weekend (SFCMP Spring Thunder; Opera Parallele; Acis & Galatea), I more or less punted on everything, attending only Friday night's San Francisco Symphony performance, where James Conlon was making his annual appearance. Well, you win some and you lose some: Conlon has been one of my go-to conductors for the last few years, following great performances of Zemlinsky, Verdi, and Shostakovich at SFS and some very fine work in Britten, Janacek, and Wagner at LA Opera. But Friday night's concert was something of a disappointment. I have to at least partly blame my seat, in Row W, which made the orchestra sound distant, and my tiredness. I had a long week at work. The rest of the audience loved the show, but I see that Joshua Kosman had some reservations about the first performance, so I am not completely alone. Conlon, as is his wont, picked up the mike as soon as he got on the podium, and started yakking about Erwin Schulhoff, composer of the first work on the program. He lost me twice: as soon as he said that probably none of us had ever heard a Schulhoff work in the flesh (I have - in fact, maybe two), and when he kept yakking and yakking and yakking. Maestro, we have program notes for this stuff. One or two anecdotes, fine, but you duplicated an awful lot of what was in the program, which, yes, I had read. The Schulhoff work in question was the Scherzo from his Third Fifth Symphony, and it is a ferocious little juggernaut. That certainly isn't all there is to Schulhoff, though, and my sense of the playing was that it was a little helter-skelter. As Joshua noted, why couldn't they have played the whole thing? This was followed by what I would guess was a good performance of Shostakovich's Piano Concerto No. 1, with Jean-Yves Thibaudet as the soloist. I like Thibaudet a lot, and this concerto has the added attraction of a very big solo trumpet part, which meant Mark Inouye, of whom I have the highest possible opinion. It is an entertaining work, with the trumpet and piano seemingly at odds with one another. (Somebody should program it with the Nielsen Clarinet Concerto, in fact, which features clarinet versus snare drum.) I enjoyed it a great deal and have little else to say, as I had never heard it before and didn't take any notes. Here's the reason that Conlon should have played the whole Schulhoff: the second half of the program was the Tchaikovsky Sixth Symphony, Pathetique, which reminded me of why I have spent my concertgoing career avoiding performances of the Tchaikovsky symphonies. I just do not like them very much. Yes, pretty tunes, but they all feel episodic to me rather than developmental. As for the performance....there were some fine moments (the march) but also some unruly ones. I had hopes that Conlon might do for the Sixth what Blomstedt did for the Schubert Great C Major a few weeks ago, but no such luck: I am not the slightest bit more convinced by the piece than I was Thursday. Maybe I need to run down some 1930s Russian performances of Tchaikowsky's symphonies, because maybe the performances I've heard just miss the stylistic mark. Or maybe I should just give up completely and leave at intermission. The Telegraph and various friends (Janos Gereben, Alex Ross) have been spreading the word: British Pathé has uploaded 85,000 historic newsreels and compilations to YouTube. It's true, it's true: but low-res versions of these films have been available at British Pathé's own web site since 2003. You can also see various important historical events and disasters, including the Battle of the Somme, Emily Davison throwing herself under the King's horse at the English Derby in 1913 to, well, just about everything. The Canadian tenor Ben Heppner is retiring from singing, at age 58. He's been singing professionally for about 35 years, and reached the big time after winning the Metropolitan Opera National Council auditions in 1988. I heard him live several times: in Lohengrin, in Tristan und Isolde in Seattle and at the Met, in Fidelio at the Met. At his best, he was a terrific singer and a gripping actor. I'm sorry never to have heard him as Peter Grimes or Enee, and like many, I've wondered at his choice of repertory over the years. He sang a lot of Wagner, but it seemed to me that, as he insisted, he wasn't a classic Heldentenor. He sounded well equipped for Britten, for the 19th c. French repertory, with its demanding fioriture and high tessitura, and for a wide range of 20th c. music. He sounded born to sing Gerontius. I can't find, on line, my all-time favorite Heppner performance, a spectacular live "Fuor del mar" - the long version - at the Met in 1991, sung with enormous energy and with every note securely in place. The audience goes insane at the end, with good reason. You'll have to settle for this original-key "Di quella pira" and weep: why didn't he sing more Verdi? Osmo Vänskä signed to a two-year contract as Music Director of the Minnesota Orchestra! He'll have a lot of hiring and rebuilding to do after the brutal 18-month lockout, but hooray! The NY Philharmonic Biennial will feature readings of works by 13 "emerging" composers (now there's a word for buzzword bingo). Of the 13, four are women. One-third: doing pretty well, I would say. Why, we could almost do a whole A to Z! Please nominate additional candidates in the comments. Steve Smith, who left Time Out NY only weeks ago, has been offered, and has accepted, a position as Assistant Arts Editor of the Boston Globe. It's a loss for NYC and for the NY Times, for which he has been freelancing, but a big gain for Boston! As I told him on Facebook, not much opera in Boston, but the new music and early music scenes are matchless. Oh, and I hear they have an orchestra, too. H/T Thomas May for the idea! I will, in fact, be teaching a ten-week class in safe rolling & falling this year. It's intended for adults who aren't studying a martial art on a long-term basis, but who would like a basic grounding in protecting themselves if they happen to fall. Over at ArtsJournal, Terry Teachout has a posting up about his first encounter with Britten's music, which happened to have been the great Serenade for Tenor, Horn, and Strings. I am reasonably certain my own first Britten was the Variations on a Theme of Henry Purcell, better known as the Young Person's Guide to the Orchestra. But the second was very likely the broadcast of the Metropolitan Opera performances of Death in Venice, the composer's last opera, which also marked one of the few Met appearances of the tenor Peter Pears, Britten's partner in life and music, for whom so much of Britten's music was written. I did not hear Pears again for many years after that, but the sound of his voice, individual as it was, stayed with me all that time. I'm lucky enough to have a couple of great recordings of the Serenade, including the very first, with Britten, Pears, and Dennis Brain, and I've heard it performed live twice, with a third encounter to follow in June. In between, I've seen several of Britten's operas - my favorites are Midsummer Night's Dream and Turn of the Screw - and heard live Les Illuminations, the Violin Concerto, the string quartets, and of course the War Requiem, in a first-rate performance by Semyon Bychkov with SFS. On record I've heard a good deal more. As to the Serenade - no disrespect to the Prelude or "Pastoral," but it's "Dirge" that kills me every time. Most of my readers undoubtedly know at least some Britten. If not, dig in; his music is both extremely beautiful and deeply moving. I know, I know: after warning you of reduced posting, here I go again. But seriously: if you haven't read the fabulous Ballad of Geeshie and Elvie, which ran in yesterday's NY Times Magazine, do yourself a huge favor and run right over there. It is a great story: music, obsessive collectors, mystery, friendship, and John McPhee-level journalism. To John Luther Adams, that is, for Become Ocean. You can hear Ludovic Morlot and the Seattle Symphony perform it in the upcoming Spring for Music Festival, should you happen to be in NYC next month, on an environmentally-themed program with Deserts and La Mer. If you have a GuideStar account - the basic kind is free - or you consult the National Center for Charitable Statistics (h/t Mr. CKDH) or Drew's 990 database project comes to pass, you have access to reams of important information about the finances of the nonprofit of your choice. The complexity of these forms varies enormously. I challenge you to understand the Metropolitan Museum of Art's 990, which includes information about attendance, assets (immense), income, donations, salaries, etc. The museum's assets include tens of thousands of art objects, valued at, I'm sure, billions of dollars, a huge and ever-expanding campus in NYC, etc., etc. It would take me a couple of days to fully comprehend the form. But the 990 of a small nonprofit isn't that hard to deal with, and opera company 990s all have the same types of information. For this reason, it's discouraging that I have now read, for the third time, that David Gockley makes more than a million dollars a year, most recent the claim that his base salary is $1.2 million. Folks, this is just not true. His base salary, as shown by some years of 990s, is currently around $525,000. The most recently filed 990 shows that Gockley received a one-time bonus of $1 million. I went into some detail in SFCV a couple of weeks ago about why I believe he earned and deserves every penny of that bonus. I'm not happy about the failure of other people reporting on this subject to get his compensation right. A half-million dollar salary is reasonable for running a complicated organization with a $70 million annual budget. Misrepresenting his earnings because you didn't do enough research is not reasonable. So I will be posting less obsessively. However, do expect plenty of blogging during my trip to London next month. I usually don't live-blog vacations, but my partner and our very large dog will be home, so I do not have my usual concerns. I bought a ticket a few months back for the first of conductor laureate Herbert Blomstedt's two programs with San Francisco Symphony, largely on the strength of the first works on the program, Carl Nielsen's Clarinet Concerto of 1928, to be played by principal clarinetist Carey Bell. Bell has been a favorite wind player of mine since he was principal clarinet of the San Francisco Opera orchestra; let's just say that I will never forget his playing in La Forza del Destino back in 2005, when Nicola Luisotti made his first local appearance. As careful readers of this blog know, I've been hoping to hear Bell in a work other than the ubiquitous Mozart clarinet concerto for a long time. And the Nielsen did not disappoint: every time I hear something by the Danish composer, I find myself amazed that he isn't played a whole lot more often in the US. His music is lively, quirky, direct, tremendously energetic, and enormously appealing. The Clarinet Concerto is an offbeat work written for a clarinetist who was evidently quite the eccentric. Perhaps the oddest thing about the concerto is the prominent solo part for snare drum; the score doesn't call for timpani, and the snare drum acts as a foil to the often lyrical, but equally often flighty, clarinet part. It's a wonderful piece and got a terrific performance all around. BUT. The big surprise on the program was Schubert's Great C Major Symphony, D. 944. I had quite seriously told Joshua Kosman before the concert that I was considering taking off after the Nielsen, on the grounds that, well, the Schubert is looooong and I am not a big fan of it. Boy, am I ever glad I stayed. 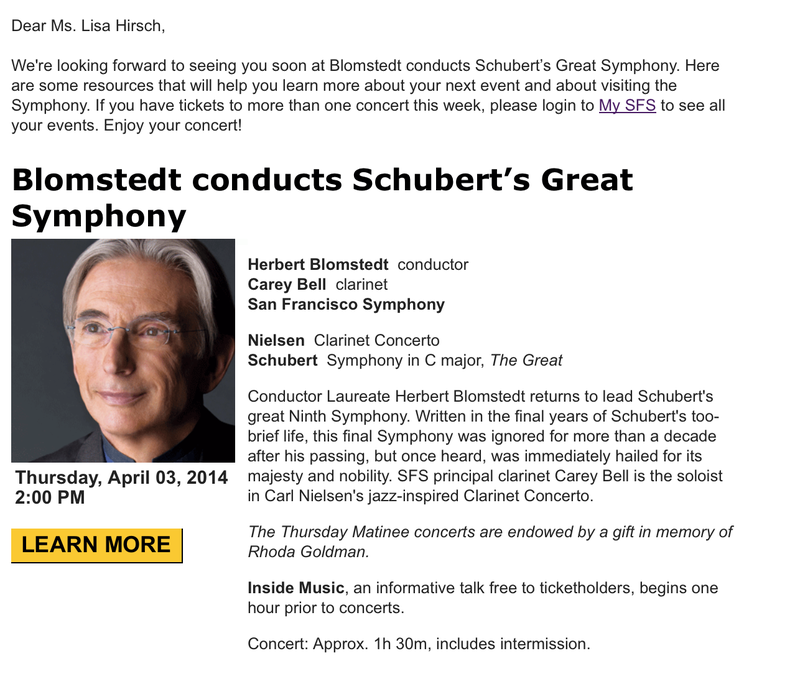 It turns out that the reason I haven't cared much for the piece is that I'd never heard Herbert Blomstedt conduct it. It is a gigantic piece, huge in scope and length and number of themes; it can be ponderous and hoo boy can it drag. But Blomstedt neatly sidestepped every one of the inherent pitfalls, conducting the work with energy and momentum from the very first theme, which was noticeably faster than I have heard it before. The performance was, indeed, long, clocking in around 50 to 55 minutes, because Blomstedt took the first and fourth movement repeats, but (except for a bit in the scherzo - how many repeats are there, anyway??) it was an entirely gripping and absorbing performance. In fact, it seemed shorter than MTT's 2009 performance, in which he omitted the first and last movement repeats. Blomstedt used a large string section, and yet there was no muddying of textures: instead, there was the most marvelous transparency, with a beautiful rich string sound in which you could still hear every inner voice and detail of the string orchestration. He had the first violins on the left, seconds on the right, basses and cellos next to the firsts on the left. I've been saying for several years that Davies sounds betters with the strings in this formation, and this concert provides a little more backup for that claim. I was also hugely impressed with Blomsted's control of the architecture and dynamics of the piece; in fact, he made the dynamics an obvious factor in the architecture and line. Really, I've never heard a better performance of the Great C Major, and I expect it will be a long time before I hear one that's as good. I have grown more and more impressed with Blomstedt over time, and I hope - given that he is now 86 - that I will have many more opportunities to hear him. Via Drew McManus: Read for yourself.